Wallapatta spell checker uses the 10000 word list1. The words not on the list are highlighted in red, and the words less commonly used are highlighted in shades of orange. 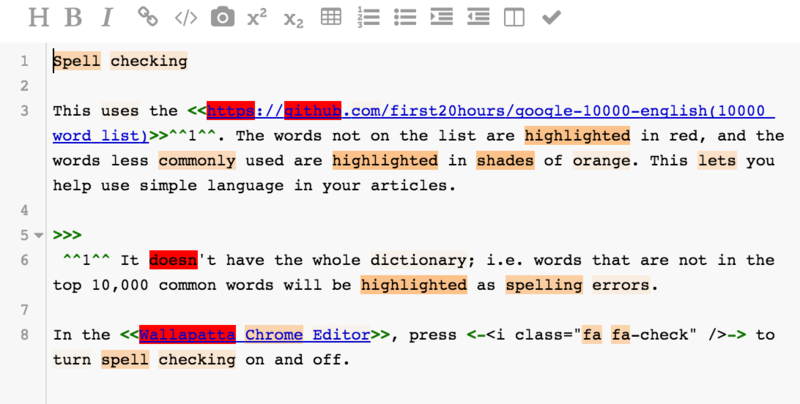 This lets you help use simple language in your articles. In the Wallapatta Chrome Editor, press to turn spell checking on and off. 1 It doesn't have the whole dictionary; i.e. words that are not in the top 10,000 common words will be highlighted as spelling errors. Wallapatta spell checker uses the <<https://github.com/first20hours/google-10000-english(10000 word list)>>^^1^^. The words not on the list are highlighted in red, and the words less commonly used are highlighted in shades of orange. This lets you help use simple language in your articles. >>> ^^1^^ It doesn't have the whole dictionary; i.e. words that are not in the top 10,000 common words will be highlighted as spelling errors. <!> !images/posts/wallapatta/spell_check.png In the <<https://chrome.google.com/webstore/detail/wallapatta/nleponjjojkllonfamfjhebhadibjlip(Wallapatta Chrome Editor)>>, press <-<i class="fa fa-check" />-> to turn spell checking on and off.